Home > News > Industry News > What do the modern 4 to 20mA loop and a pneumatic control system have in common? What do the modern 4 to 20mA loop and a pneumatic control system have in common? Current vs percentage of full-scale. The 4 to 20mA loop is currently the most common signal standard in modern use, but inherent within it is the ratio of 1:5 that was present in old pneumatic control systems. In the 4 to 20mA loop 4mA represents 0 and 20mA is 100%. 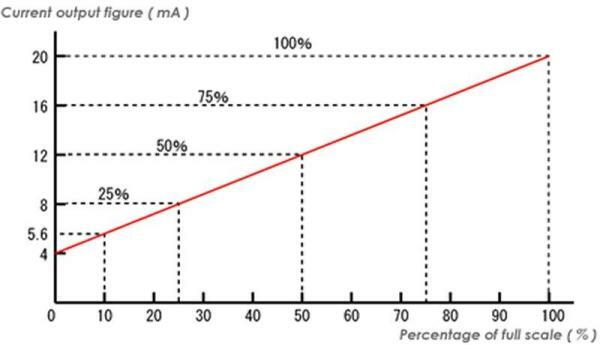 On this scale 12mA, the halfway point between 4 and 20, would represent 50%. The 4 to 20mA current signalling hasn't always been the standard. 10 to 50mA was once in use but has become obsolete, mainly for safety reasons. The lower circuit voltages and current levels in the 4 to 20mA system meant that there was less risk of personal injury and sparking that could ignite flammable athmospheres in some industrial environments. Pneumatic control systems use compressed air in the ratio of 3 to 15 pounds per square inch, where 3psi represented a live zero and 15psi 100%. A pressure below 3psi is a dead zero and an alarm condition would be initiated. Electric and electronic control made its debut back in the 1950s, but the 4 to 20mA system still emulates the 3 to 15psi pneumatic signal with the common ratio of 1:5, also present in the 10 to 50mA system, and that's the link between the modern system and an early pneumatic control. There is further information on this on Wikipedia and quite a helpful tutorial on YouTUBE.